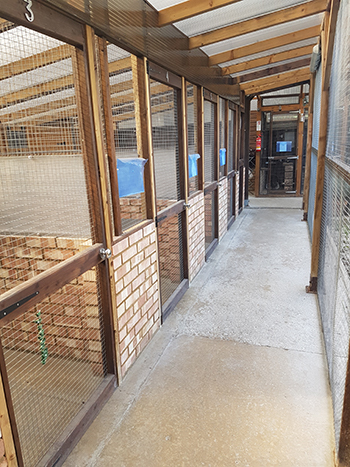 Our recently refurbished cattery provides a calm, secure location for your feline friends to enjoy their holiday. The cattery itself is key coded for maximum security. We have a number of different sized cabins dependant on what you feel would best suit your cat/s needs, all charged at different rates. For a quote please feel free to contact us. All cabins are fully covered overlooking a central garden area. They consist of a raised internal sleeping area of which is heated during the winter months. 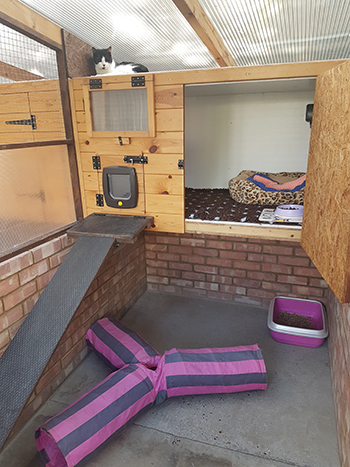 Down a set of steps is the more external area where cat litter trays are provided as well as toys. We stock Felix or Whiskas wet food in jelly as well as Hills s/d and Pro plan dry all of which are included within the daily boarding cost. Customers are more than welcome to provide their own food for their cats stay if they wish. 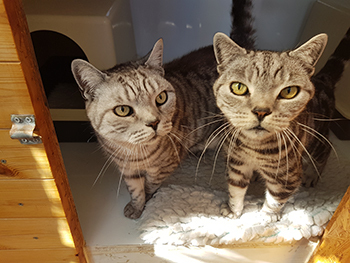 We do offer extra fuss sessions for cats during their stay if they do like the extra attention.